Starhawk is a member of the original Guardians of the Galaxy that existed in an alternate timeline in the 31st century. Starhawk has knowledge of different life times and basically relives his life over and over again. He comes back to his infant state after a cataclysm happens in the future. He is also united in one body with his adopted sister Aleta. He may be one of the weirdest, trippy characters that Marvel has ever made. There is a rumor that Sylvester Stallone will play Starhawk in Guardians of the Galaxy 2. "I am the wisdom and the glory of your ancestors. I am the light and the giver of light. I am your heritage and your destiny! I am the POWER that was Arcturus!" Get ready to open a big can of weirdness. We are entering the the Starhawk ZONE! Starhawk is born in modern times, he is the child of Quasar and Kismet (Artificial like Adam Warlock) and is half human and half artificial life form. He is sent into the future and is first raised by mutants on the planet Arcturus, then by an Arcturian Reaver named Ogord who names him Stakar. He is raised as Ogord own son along with the rest of his family. Stakar studies science and archeology and begins to explore the ruins of the old gods of Arcturus. After exploring ruins of the Hawkgod he is transformed. His body and the body of his sister are combined along with powers of the Hawkgod into Starhawk. He becomes trapped in a cycle of rebirth where he is born again and again. Each time he remembers the past events of his former life. He is able to move and alter time, however despite these great powers he is unable to prevent a future cataclysm. 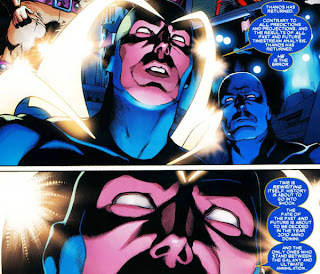 Part of Starhawks plan to avoid the cataclysm is to form the team known as the Guardians of the Galaxy. He has forced this team together at various points in the time line to save the universe. In the beginning he and his adopted sister Aleta are forced to share the same body. Only one can take control of the physical form at a time. They fall in love and petition the hawk god that gave them the powers to separate them. They have a family but this ends tragically when Aleta's father turns their children into weapons to be used against Starhawk. The children die and Aleta blames Stakar for their deaths. There are various different forms taken by Starhawk, sometimes with Stakar and Aleta seperate sometimes with one or the other controlling the form. There is even a dark, almost evil form of Starhawk where Stakar forcibly joined Aleta. Eventually, Aleta regained control. In the end Stakar always ends up as an infant and is sent back in time to relive his whole live over again. Starhawk is powerful but his powers are not always super defined. They sometimes vary based on whether he is controlled by Aleta or Stakar, or whether they are joined together. He can travel at speeds faster than light. Is immune to radiation, and most diseases. Is super strong, durable and fast. Can survive and travel in space. He can control light, make beams and objects out of it. Sylvester Stallone will play Starhawk in Guardians of the Galaxy 2. There is some thought that the Ravagers group may be lead by different characters from the 31st Guardians of the Galaxy Team and that on top of Yondu there is a Starhawk, an Aleta, Vance Astro, Martinex, and Charlie 27. 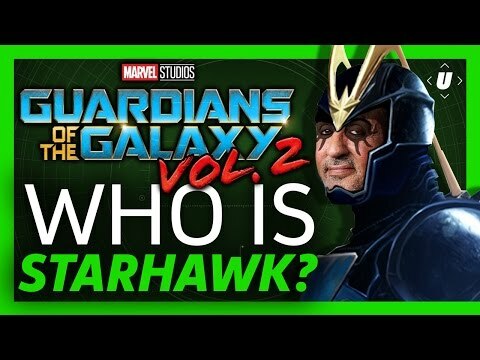 It hard to know how valid this rumor is but James Gunn has said that Starhawk was his favorite Guardians character. Production notes from Marvel on Stakar in Guardians of the Galaxy 2.